The Australian excavation at Saqqara has been centred on the tomb of the vizier Mereruka near the pyramid of Teti I. Mereruka's was a magnificent 32-room tomb. The mission has also uncovered mummies in a cemetery, although where this is is not clear from the article: "Included in their discoveries are rare mummies of common people forgotten in the massive ancient cemetary, of which about a fifth has been uncovered". "The ninth International Congress of Egyptologists in Grenoble was immersed in the debate over two French architects' claims of having located Khufu's sepulchral room in the Great Pyramid at Giza." A report on the press-heavy lecture by the two French architects at ICE9. A private collection of various paintings and collectibles. One of the items is an Egyptian sarcophagus, which is dated to between the 6th and 3rd centuries BC, has a list price of £2,000 to £3,000. A short article about the use of alabaster in the Old Kingdom. Musings on a 3rd or 4th Dynasty Dam, Sadd Al-Kafara, some 25 kilometres south of Cairo, to the east of Helwan, which was destroyed by rain soon after completion. This is a piece of popular narrative journalism, but it contains some interesting information. A new study has shown that Ramesses II suffered from a form of degenerative arthritis which resulted in high levels of bone growth along the vertebrae of the spine. This is in opposition to another study which suggests that the skeletal damage was caused by ankylosing spondylitis (A.S), a condition by which some or all of the joints and bones of the spine fuse together. "Egypt is to take part in the conference of the International Federation for Tourist Guides due to be held in Melbourne, Australia on January 15". "The tourist boom which Egypt, is currently enjoying requires a review of the national strategy for tourist development for the upcoming ten years , a matter that needs time". 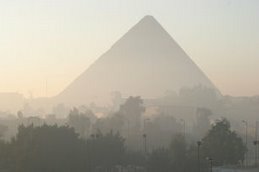 The article discusses the development of tourism in Egypt. The British Museum's web pages dedicated to their Sudan exhibition, with lots of information to complement it. Information includes an exhibition description, exhibition map, highlights, programme of events, and details of the Oxfam programme to help the present victims of the political situation. A bit more about the French request to auger in the Great Pyramid, as well as a brief report about the International Congress of Egyptologists in Grenoble, and plans to reform the International Association of Egyptologists. Archaeology Magazine has two new Egyptology-based books by Zahi Hawass in its most recent issue: a book for children, and a coffee-table book. This article offers a summary of the main contentions of Joann Fletcher's new book re Nefertiti. The book describes Fletcher's search for the body of Nefertiti and her claim to have found it in the tomb of Amenhotep II. It is a particularly contraversial story, following on from her widely discredited claims made on the Discovery Channel, which also bypassed Supreme Council of Antiquities regulations. Inspired by the British Museum's Sudan exhibition, this is a very good article about the Kingdom of Kush, and its language, Meriotic (as yet not deciphered). "The mission of the Supreme Council of Antiquities announced the unearthing of archaeological cave dating back to the 4th century in Pharaoh Hamam area in Sinai. " As always with the Egyptian State Information Service, this item is brief and not very clearly stated. More on the British Museum's exhibition of Sudanese archaeology: "Among some of the funerary objects are small carved figurines dating back to 4,500 BC which would not look out of place in a modern exhibition of abstract art. Visitors are welcomed by a full-sized statue of the Kushite ruler Anlamani which reflects Sudan's position on the cusp of the Arab world and Africa. Anlamani stands in a classically Egyptian pose but has unmistakably African features." I haven't visited the exhibition yet, but it looks as though it is going to be marvellous. "Grenoble, in France, the home of renowned Egyptologist Jean-François Champollion, is currently being prepped to host some 1,500 Egyptologists from around the world" The global forum for Egyptologists, featuring lectures and discussions about a whole range of Egyptological topics, will take place from the 5th to the 12th September. This article explains the theory and also describes how the two amateur Egyptologists want to test their hypothesis - by drilling holes into the base of the pyramid (augering). Zahi Hawass has refused, saying that it will cause unnecessary damage to the pyramid. This 26th Dynasty site, described as "under the shadows of the pyramids" contained 400 tiny shabti figures. This sounds suspiciously like a former posting that described another 26th Dynasty Tomb with the same number of shabtis, but that was supposed to be in a different area of Cairo. Anyway, the article is here for your perusal! http://www.egyptologues.net/pdf/pyramides/meidum.pdf An architectural study of the Meidum Pyramid has been posted online. You will need Acrobat PDF Reader to access it. It is a 24-page report with some fascinating diagrams and photographs of the interior. Multidetector computed tomography (MDCT) was used for the first time to produce a detailed 3D model of the face of the 3,000 year old mummy of a - without having to unwrap him. The mummy is that of of an artisan named Harwa. More info is in the article.